Received 3 March 2010; revised 14 April 2010; accepted 15 April, 2010.
curring in this group of patients. general health had been deteriorating for some months. breath on exertion, fatigue and fainting episodes. systolic murmur over the tricuspid valve area was noted. and nervous system was without pathological findings. tive, HIV I and II-negative. pO287 mmHg, Bicarbonate 22.8 mval/l. BE –1, 9. (TLCO) 5.24 m m ol /m i n/ kPas (47% ). + central venous pre ssure. line birefringent material (Figure 2). femoral vein on at least one occasion. heart rate of 12 0 bpm. (30%), TL C 4.37l (69%). cronodular pattern with conglomerate formation. birefringent material (2.5 × magnified). Bicarbonate 17.5 mmol/l, BE –4, 4.
stitial, micronodular changes throughout both lungs. dose of 0.5 mg/ kg b odyweight) was gi ven . and the right uppe r l obe. specimen from left lower lobe. with multiple foci of abscess formation. structive airflow and a reduction in diffusion capacity. patient’s history to suggest extrinsic allergic alveolitis. Serology for that purpose was also negative. flamemation surrounding typical foreign body giant cells. 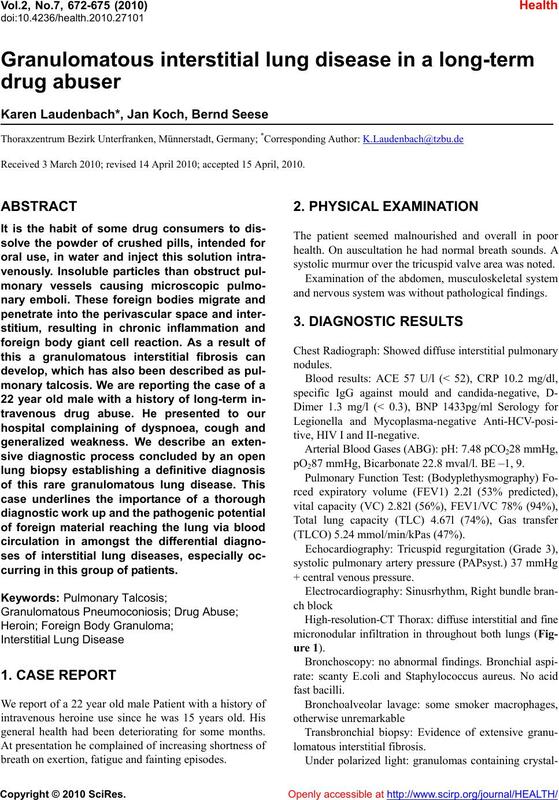 pulmonary talcosis (drug abuser lung). cough, progressive dyspnoea and weight loss . ment of gas transfer . 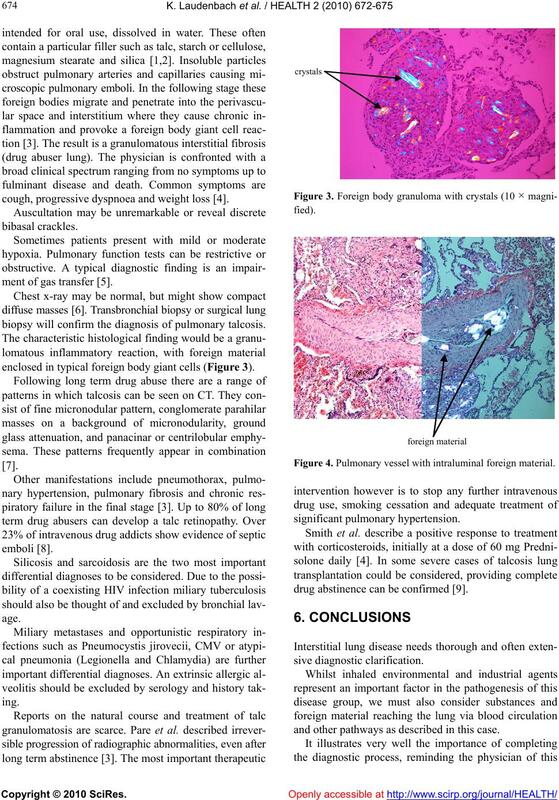 biopsy will confirm the diagno sis of pulmonary talcosis. enclosed in typical foreign body giant cells (Figure 3). Figure 4. 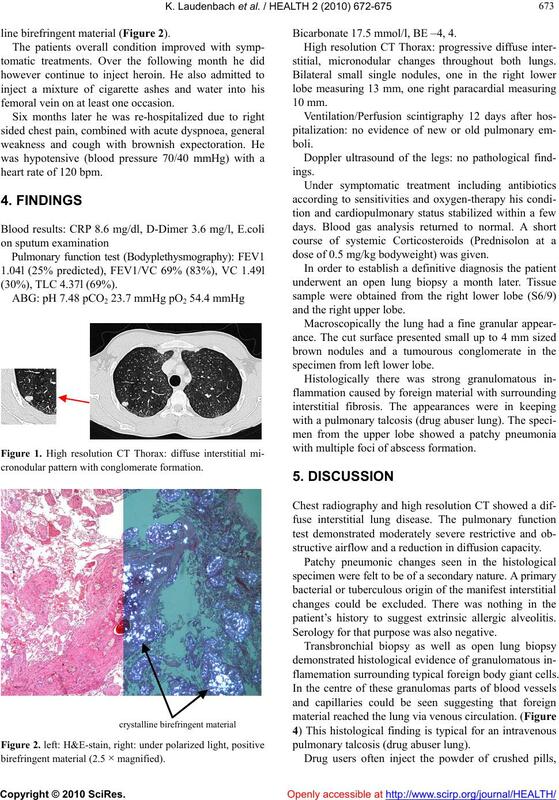 Pulmonary vessel with intraluminal foreign material. drug abstinence can be confirmed . and other pathways as described in this case. presentation is independent and the conten t remains neutral. Edition, Saunders Company, Philadelphia, 1794-1803.
follow up of drug abusers with intravenous talcosis. 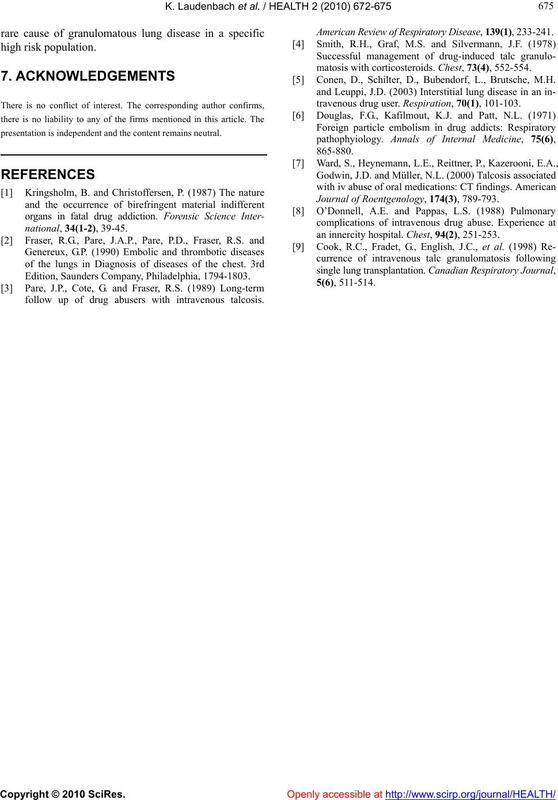 American Review of Respiratory Disease, 139(1), 233-241.
matosis with corticosteroids. Chest, 73(4), 552-554. Conen, D., Schilter, D., Bubendorf, L., Brutsche, M.H. travenous drug user. Respiration, 70(1), 101-103. Journal of Roentgenology, 174(3), 789-793.
an innercity hospital. Chest, 94(2), 251-253.